The entire movie takes place during one night. If you’ve watched a lot of horror movies, or a few specific block-busters, you’ve seen Scott Spiegel. He shemped in Evil Dead and Evil Dead II and had cameos in several other Sam Raimi films, including Spider-Man and Spider-Man 2 . What’s more interesting about him is his work behind the scenes. Co-writer of Evil Dead II ; executive producer of Hostel ; and writer, director, or producer of a dozen other genre films. The one we’re looking at today he directed and co-wrote, and it’s decent little slasher. 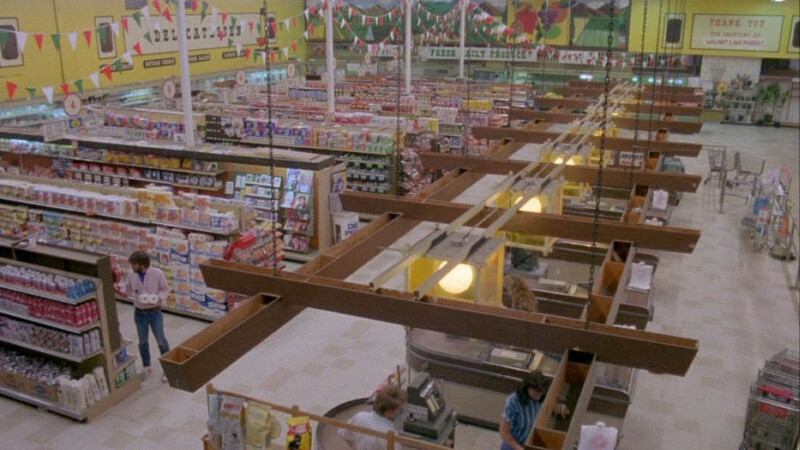 Intruder takes place entirely on the grounds of Walnut Lake Market, a small local grocery in Walnut Lake, Michigan. It’s a real community, northwest of Detroit, and it happens to be Spiegel’s home town. Though the setting is tightly bounded, there’s plenty of room for the killer to move around out of sight and pick off staff unnoticed. It makes for an oddly expansive claustrophobia, which makes me wonder if any film other than The Mist has made such great extended use of a market. Walnut Lake Market soon to be coated in movie blood. There are some cast members of note to fans of Evil Dead II . Bill Roberts, the co-owner of Walnut Lake Market, is played by Dan Hicks. 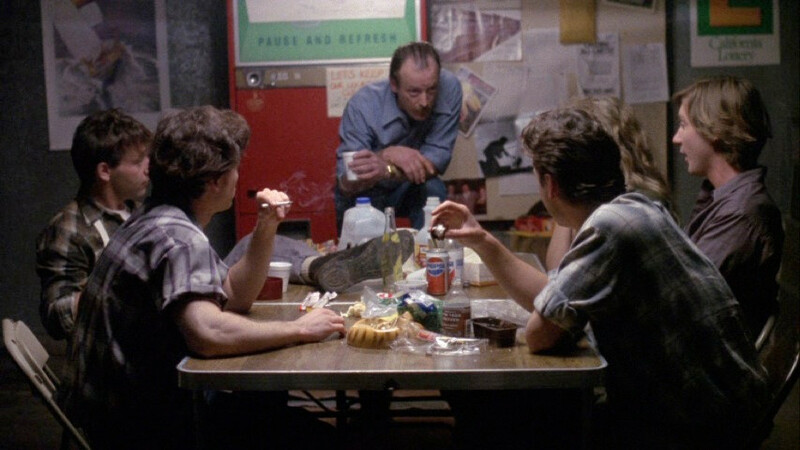 Brothers Sam and Ted Raimi fill the roles of Randy and Joe, cutters of meat and produce respectively. Spiegel and Bruce Campbell also have cameos, although if you blink you won’t see The Chin That Walks. While it’s unquestionably a film awash in the Sam Raimi standard players, he’s just there to slice meat and get killed. It’s Spiegel’s show, and his friends are just there to help. 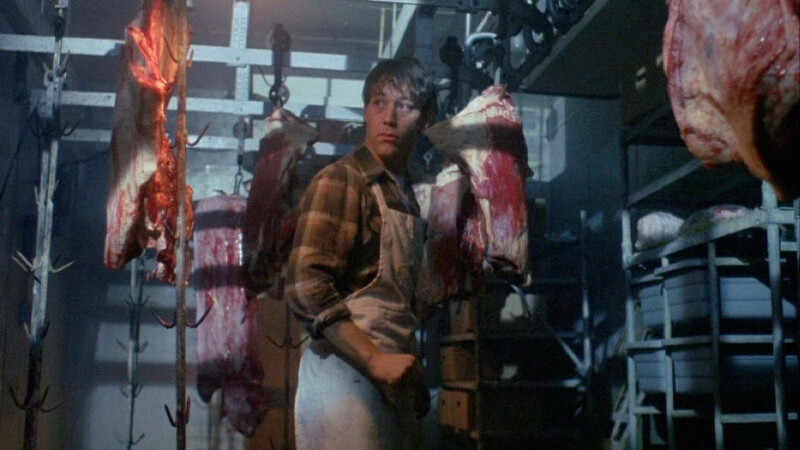 Sam Raimi checks the meat locker for the intruder. The setup in Intruder is that the market’s night shift is preparing for a close-out sale. The store has been losing money, and the controlling owner decided to cut his losses and sell the land to the city. The closing cashiers are there as well, cleaning their stations and helping with a few of the displays. There’s also an ex-con loose in the store. Craig Peterson (David Byrnes) entered the store just before closing to confront one of the cashiers, Jennifer Ross (Elizabeth Cox). She’d broken up with him a year ago, after only dating for a short time. His brief stint in jail was for killing someone in a fight shortly after that. After a scuffle involving the majority of the staff, Craig has disappeared into the back rooms of the grocery. When people start dying, he’s the natural suspect. Craig accosts Jennifer at closing. I’m honestly surprised that I’d never heard of this before Amazon recommended the Synapse release to me. It’s a decent slasher, with good acting, competent effects, a coherent story, and really nice editing (there are some beautifully cut montages of people doing work around the store). The camera work is occasionally a bit precious — one shot is from underneath the dial of a phone, so there’s essentially a circular stencil with holes over the lens — but for the most part it’s pretty solid. So what kept it from being better known? Bill shares a grisly tale from his days as a fireman. As usual, I have a theory. By 1989 slashers had become passé, at least ones that were about ordinary human killers. 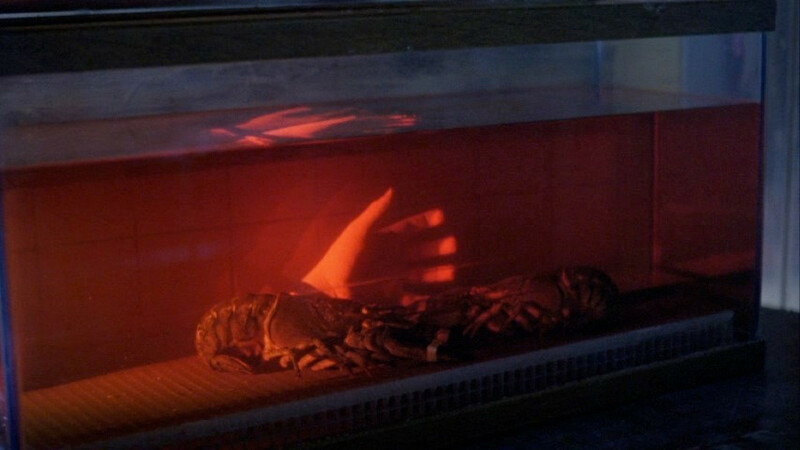 The genre had transformed into creature features, featuring murderous and often eldrich beings that are no longer human. For context, this came out the same year as Friday the 13th Part VIII: Jason Takes Manhattan . Intruder was a throwback to the more straightforward movies that had spawned the genre over a decade earlier. It would be another 7 years before Scream revived non-supernatural slashers for an audience burned out on increasingly terrible and silly sequels that kill off the antagonist at the end of every movie only to come back at the start of the next. Intruder missed the height for its genre and came too soon for its resurgence. The lobsters asked for none of this. 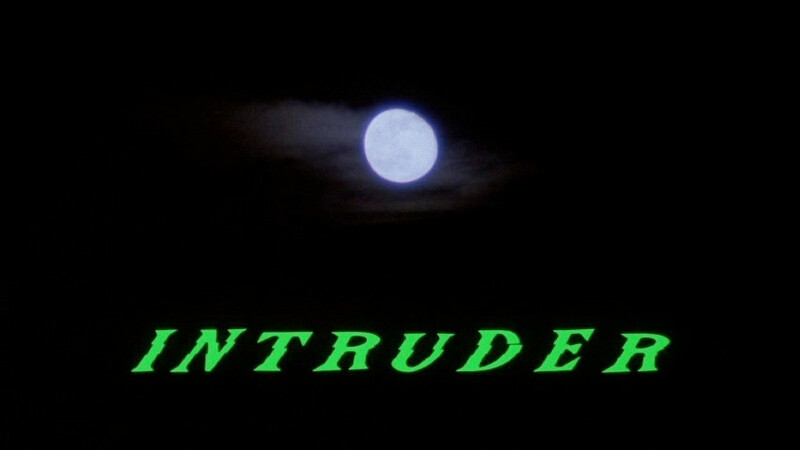 Intruder is an enjoyable and solidly-made movie. Fans of old-school slashers and practical effects gore should have a good time with it. While tame by today’s standards, it’s a cut above a lot of the field. It says something that the most shocking thing about the gore reinserted to the director’s cut is how well-executed it is. Plus, if you ever wanted to see Ted Raimi get a cleaver to his melon, this is your opportunity.